Fudgy Flourless Brownies that are vegan and gluten free. O.M.G you guys! These brownies are awesome! I have made my Super Moist Flourless brownies in the past and those were great. 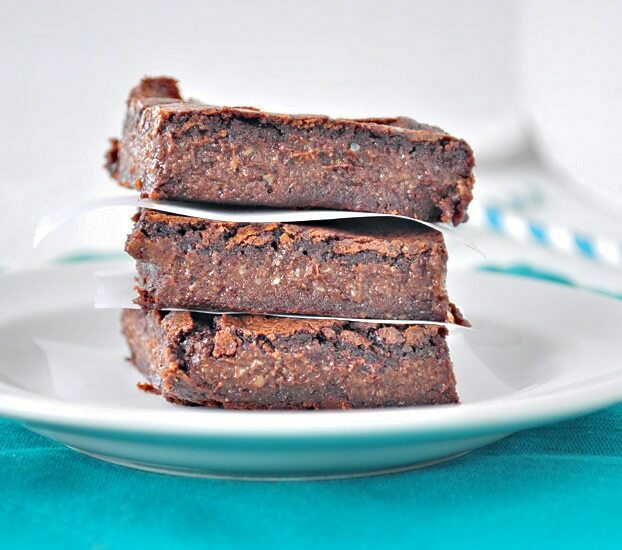 Well these healthy brownies are amazing! 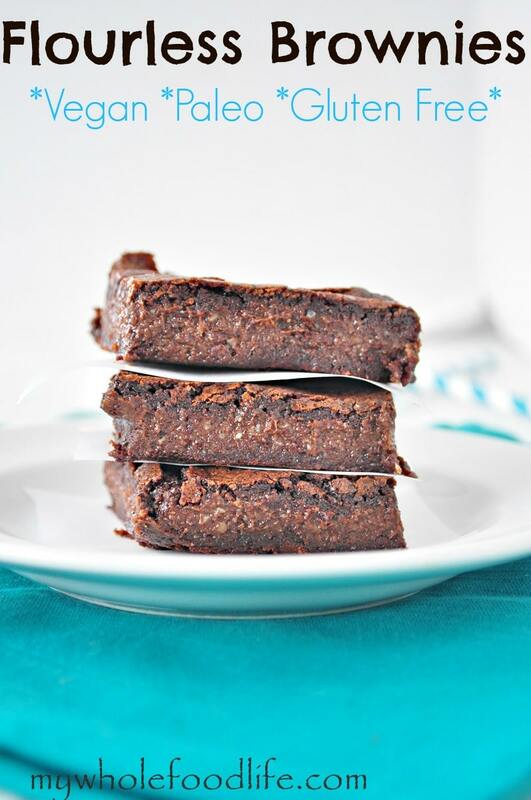 These fudgy vegan flourless brownies go to the next level of awesomeness. They are flourless thanks to a secret ingredient. I will give you a hint. It’s not beans! These flourless brownies are so rich. Imagine a crisp outer layer with a gooey inside. Almost as if they were under done. This recipe is an adaptation of Delighted Momma’s Zucchini Brownies. Looking for more flourless recipes? 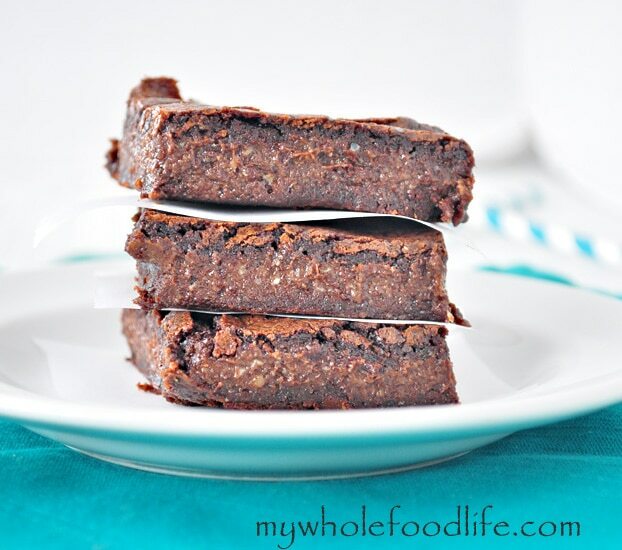 These super moist and rich brownies are secretly healthy! In a food processor , combine all the ingredients and mix well. Pour the batter into a parchment lined pan. I used an 8x8 glass baking dish . Let the brownies cool completely before removing them from the pan. They should last 1 week in the fridge. You can also freeze them. A few things to note: These brownies will almost seem like they are underdone. Once they have finished cooking,let them cool completely and put them in the fridge and they will firm up nicely. I used macadamia nut butter because I like the buttery texture and taste of it. If you want to use it, just take 2 cups raw macadamia nuts and blend them in the a blender or food processor. I used my Blendtec with the twister jar and it took only 2 minutes. You can also sub another nut butter if you wish. Store these in the fridge in an airtight container. I like to put a layer of parchment paper in between each brownie, so they don't stick together. Looks really good can i subtitute the macadonia butter for regular butter or almond butter? Thanks!